I just don’t know what to say about this. I left this one out of my initial coverage of Hal Con 2011, but as the holiday season is upon us, I feel that maybe it was time to give it mention. Jesus Needs Help is a indie-press comic that was sold next to the Ink’d Well Comics booth at Hal Con 2 (2011). The reason I left it out is because I know literally nothing about it. Nothing, save the title and this one promotional gimmick. I don’t know the premise. I don’t know the story. I don’t know who published, wrote, or drew it. I know nothing about this comic. But just the image and poster demand discussion, don’t they? I mean… Look at it. Jesus Needs Help, and there he is, looking nervously at scary shadows. I can’t even imagine what this is about. Are they devils? The Romans? Scientologists? I don’t know. And the promo poster. 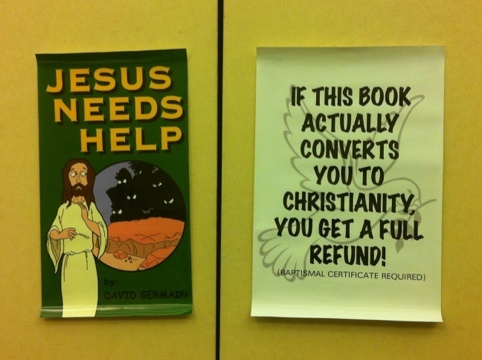 “If this book actually converts you to Christianity, you get a full refund! (baptismal certificate required)” That’s just compelling. I love ads like this, mostly because it makes me want to do them. Ask Ellen, I’m actually insane enough to buy this book, get rebaptised, then return to next year’s con with the certificate and demand my money back. Just to see the look on their faces. And with fans of Ink’d Well saying “I found salvation through Ink’d Well Comics” right next door, it was just a strange funnybook religious presence. Is it wrong that this book offends me? I shouldn’t say offended. I’ve done much harsher. And I haven’t read it. I guess I’m just aware that some people I know would be offended and in empathizing / channeling them. And that makes me feel bad. I feel like those people who wrote hate mail to Kevin Smith over Dogma without ever having seen it. So if anyone wonders why I didn’t buy this, it simply leaves me unsure of what to feel and that makes me uncomfortable. Maybe I’m not as progressive as I think. Read it and tell us what you think. I probably should! Any way I can get it from Newfoundland? You can buy it through Amazon. I’d link to it, but that’d probably designate this as spam.